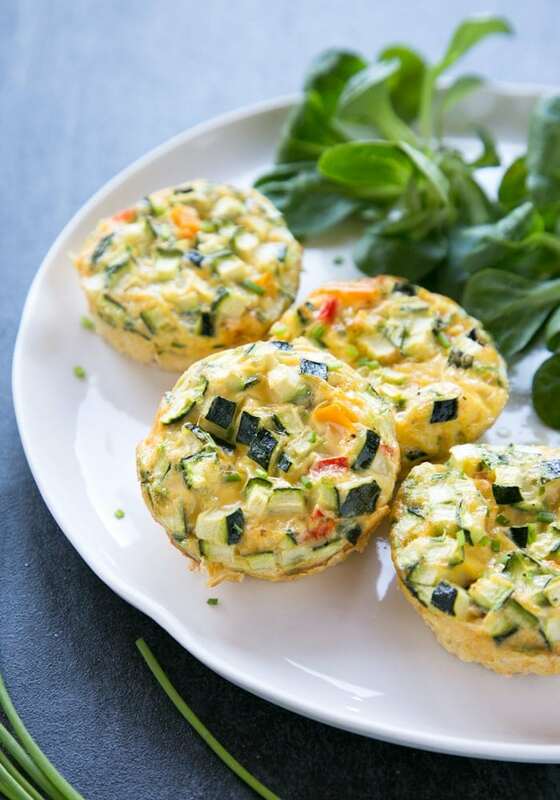 These healthy protein-packed Veggie Omelet Muffins can be easily made in advance and are naturally gluten-free and vegetarian – The perfect healthy bite-sized breakfast on the go for busy mornings! Late breakfast on weekends is one of the things I love the most, and in our family pretty much always involves eggs. Whether it is simply poached eggs on avocado toast, all kinds of Italian frittata or classic French omelettes, fresh local eggs are the star of our breakfast time. 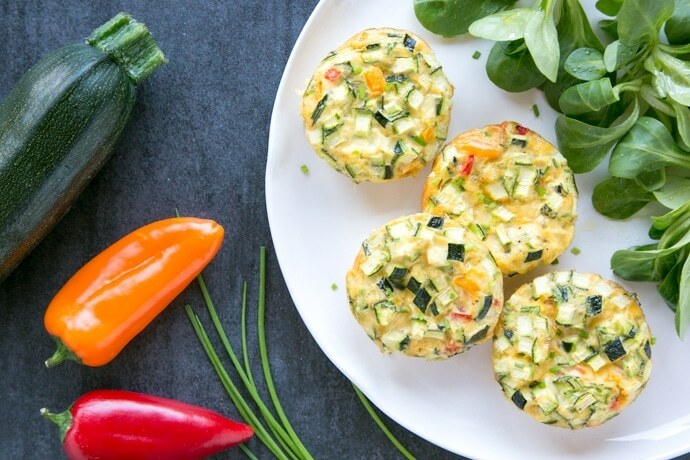 Lately, I’ve been quite obsessed with these easy protein-packed veggie omelet muffins. 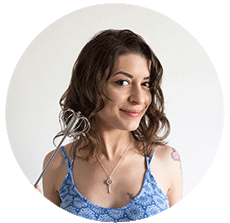 Naturally gluten-free and vegetarian, these are totally customizable to meet your taste. I personally like to keep them pretty simple and packed with veggies. I love making a big batch on Sunday morning and serve them piping hot from the oven, but they’re just as tasty at room temperature, making them perfect picnics/lunchbox material. 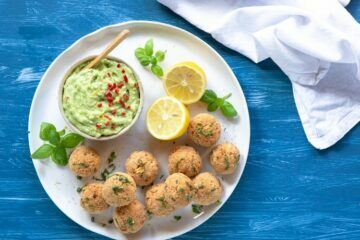 They’re also easily freezable, so you can enjoy these savoury bites all week long. All you have to do is pop them in the microwave for a couple of minutes to have a delicious breakfast ready to go. These easy Veggie Omelet Muffins come together in less than 30 minutes and can be easily made ahead. Best of all, you only need 1 bowl, 5 minutes of prep and a bunch of fresh simple ingredients such as eggs, milk and veggies. These omelet muffins are really quick and totally fuss-free to make. All you have to do is beat the eggs, fold in milk, seasoning and chopped veggies and divide the mixture into the cups of a large muffin tin. Pop your omelet muffins in the oven for about 15 minutes, and you’re pretty much done! I used fresh courgette (zucchini), mixed bell peppers and shallots (white/red onion or spring onion work great too), but feel free to use your favourite veggies or whatever you’ve got in the fridge. Make sure you don’t skip the milk, as it gives a nice airy texture and makes these omelet muffins spongy and lighter. 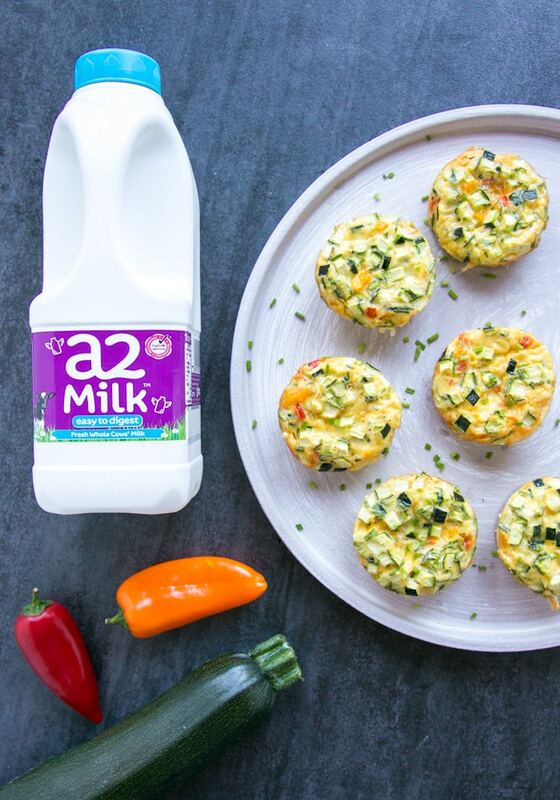 As you may know already, I’ve been dairy intolerant for years, so to make my omelet muffins I use a2 Milk™. If you’re not familiar with a2 Milk™, it’s an award-winning brand that produces milk naturally free from the A1 protein, so it’s easier to digest than normal cow’s milk for some people, and is super gentle to your tummy. If you suspect you have a lactose intolerance, it might actually be the A1 protein in milk that you can’t digest, so you may want to give a2 Milk™ a try – making the switch did work for me! 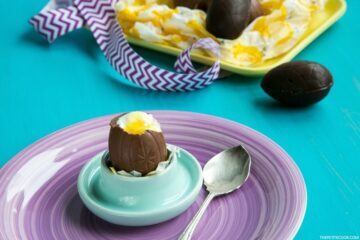 Now, back to this awesome egg-celent snack for a moment- What’s not to love? Packed with protein, healthy veggies and SO easy to make, these hearty Veggie Omelet Muffins are easily going to become a family favorite! I made this and my family loves it. 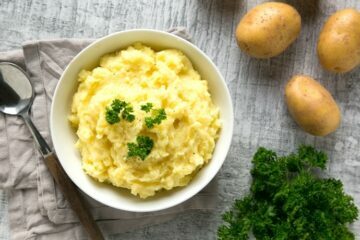 Very easy to make and very tasty. Love all the veggies in there! Have been seeing the a2 milk around. Interested in checking it out. These egg muffins look delicious! We make these all the time, although we call ours omelet cupcakes. Such a great way to use up leftovers. These look so cute. Love that they are also healthy too. Definitely a good way to sneak in some extra veggies.